A prebiotic supplement proven to support the efficient functioning of the horse’s gut by helping to maintain the balance between beneficial and harmful species of gut bacteria. Digest Plus contains short chain fructo-oligosaccharides (scFOS) which act as a food source for beneficial gut bacteria, such as Bifidobacteria and Bacteriodes. These are then able to flourish at the expense of pathogenic species whose prevalence is reduced through a process known as “competitive exclusion”. Beneficial gut bacteria are involved in the digestion of fibre in the horse’s hind gut and some species produce essential B vitamins, whilst Bifidobacteria are known to aid the body’s natural defences against malignant cells. 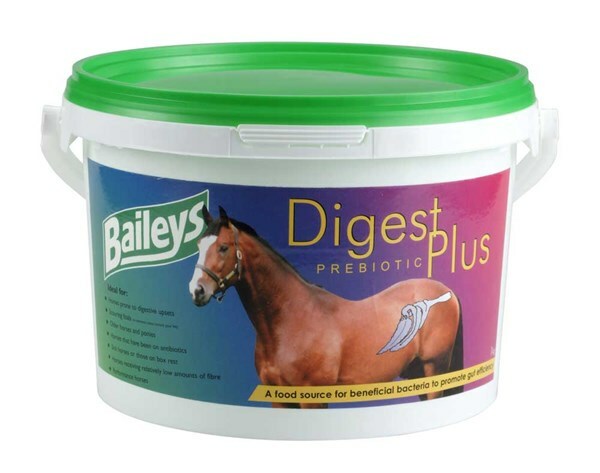 Digest Plus is particularly useful at times of stress when bacterial populations may be compromised, resulting in loose droppings, loss of condition or other digestive upsets. It can be fed in the short term, to help a horse through a particular upset or on an ongoing basis for horses whose digestive health may continually suffer due to travelling, competing or frequent changes to diet or routine, and to older horses.